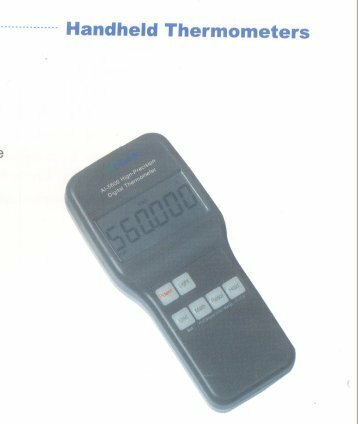 Manufacturer & Supplier of Handheld Thermometer & Handheld Thermometers. Our product range also comprises of Electrical Control Panels, Solar Equipments and Electrification Projects & Services. 40 Widely used for production, scientific researches and laboratories which require portable precise temperature measurement. Input type: Pt100, Pt1000, 0u50, Cu100, K, S, E, T, J, R, B, N, as well as Q, mV and mA. For thermocouples there are 3 compensation modes, internal, external and manual. Measurement accuracy: up to 0.02% FS (Al-5600, Pt100), up to ± 0.5 °C (AI-5500, Pt100) Mathematical-statistical measurement: Process values, Relative value, Max. and Min. value, Average value, Peak-peak value, Standard deviation and Sampling number. 4 display unit (0 or mV, °C, °F and K) for RTD and thermocouples. Low power consumption: 3 AA batteries, typical over 1,500 working hours in no backlit usage. Electronic Temperature Characteristic Table is included with Al-5500: interactive search of 11 kinds of thermocouples.